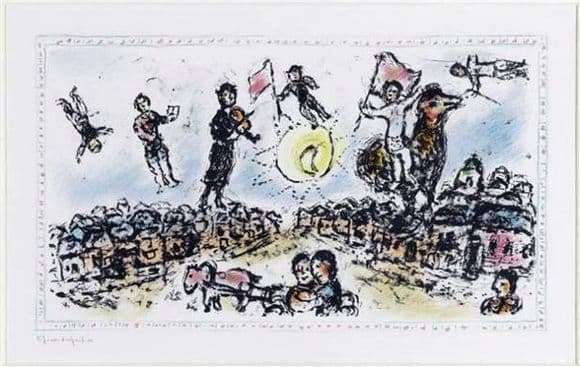 Before us is a lithograph created in the primitivism technique characteristic of Chagall. To understand the meaning of this work, it is worthwhile to realize the meaning of the artist’s work as a whole. In the lines and colors of Chagall through the whole stream of the purest lyrics. This is a real poem in which all the events that took place in the artist’s life, visions, folklore motifs and their own vision of the world are intertwined. That is why each of his paintings is so unusual. In his works, the features of living reality are completely preserved, but at the same time the painter creates symbolic images. In the art of the painter, you can see something in common that makes him related to the magic of a traditional fairy tale. But the artist does not seek to lead us away from reality into the bizarre world of fiction. Chagall simply interprets reality in his own way, expressing it in the maximum depth of symbols. In his paintings, the real mystery unfolds. It involves almost everything real and unreal, good and evil. Art of Shagal is life-affirming coloring. The artist depicts a holiday. People cheers. In all the details, a special mood of elevation is felt. In the foreground, you can see a cart with a horse. Which is a symbol of old Russia. On the middle ground, Chagall depicts a people who came here to celebrate such a joyful event together. In the background we see people hovering with red flags. They are so happy with what is happening that high spirits do not allow them to be on the ground. That is why they proudly hover over the jubilant crowd. In the very center, Chagall depicts a fabulous moon, which looks at everything impassively. World of Chagall is really special. He interprets reality in a completely new way and in a special way passes it through his consciousness of the painter. Consider his creation can be infinite. Every time you will find new characters and something interesting.